There is a saying that the greater your storm, the brighter your rainbow. This seems to be the idea that director Priyantha Colombage has tried to capture in his latest cinematic voyage, 'Dedunu Aakase'. 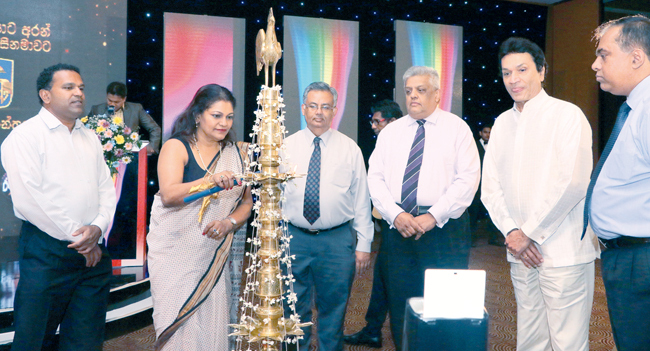 The team held the 'muhurath' ceremony of the movie recently at Galadari Hotel, Colombo. A Swarnavahini production, 'Dedunu Aakase' stars upcoming actor Hemal Ranasinghe in the lead role. Two new faces to the screen will join him as his leading ladies: Chulakshi Ranatunga and Shanel Fernando. 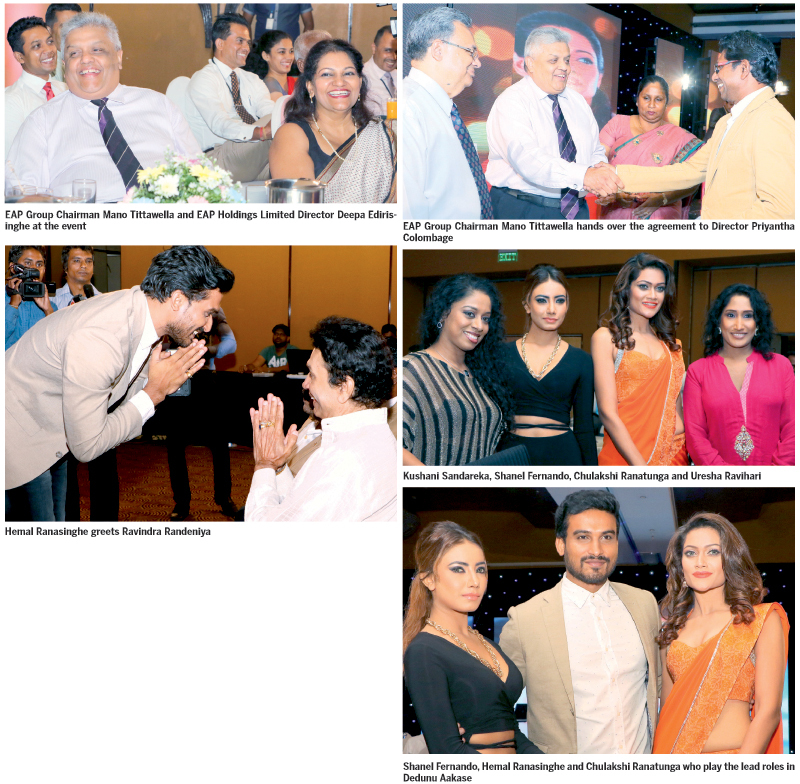 Chulakshi is Miss World Sri Lanka 2014 while Shanel is a seasoned model. The movie rotates round the lives of Samudra, Vihangi and Pavani. Both Samudra and Vihangi are two youths who are well versed in dancing. They complete their education and train to take part in a dance competition. But Vihangi becomes injured in the process and has to bid adieu to dancing for a few months. Enter Pavani. Vihangi sees that Pavani has a flair for dancing and tries to link her up with Samudra so that the two can take part in the competition. But Samudra is against the idea at first. Vihangi somehow manages to convince him that this is the best step to take at the moment. So Pavani and Samudra start to practice the dance items together. Vihangi is in love with Samudra but Samudra only sees her as a friend. He also knows that his family will never welcome her to their home as his future partner. As time passes Samudra and Pavani form a relationship. Vihangi is detached from their life. But after eight long years the three meet again. This meeting changes their lives forever. This triangular romance is what is brought onto the wide screen through 'Dedunu Aakase'. Director Colombage along with Tharaka Herath Dhamunumulla has written the script. Ranga S Bandara who has worked with Colombage in the advertising sector will be handing the camera for the movie. Megha Kavinda Colombage and Diran Wijesinghe are the editors of the project. Chitral Somapala will be handing the music while Upul Shantha Sannasgala, Nandana Wickramage, Vajira Mahakanumulla and Priyantha Colombage had penned the lyrics of the songs in the movie. The assistant director is Donald Jayantha. The art director is Mangala Fernando. Nalin Prematileke will be handling the makeup department while Udeni Alwis and Megha Kavinda Colombage are in charge of the still photographs. The colour grading too is by Megha Kavinda Colombage. Janaka Ullandupitiya designed the costumes. The line production is by Palitha Tennakoon and Ruvin Maladeniya. The recording and graphics are by Diran Wijeyasinghe. Apart from the lead actors, Jayalath Manoratne, Saheli Sadithma, Srimal Wedisinghe and Madhini Malwatte too will be acting in the film.